Move over, Marvel heroes. At Temple Beth-El, we have our own superheroes, and we are proud to be celebrating everything they’ve accomplished at the upcoming gala dinner dance on Saturday, May 11, 2019. Here’s a closer look at our three honorees and what inspires them to go above and beyond. It makes sense that supporting Jewish youth is a significant passion for Ellen Davidson. After all, she was just a teenager when temple and all that it represents became an important part of her life. Ellen recalls that her involvement in temple life began when she was a teen in NFTY. “My mother was a young widow with limited financial resources, so I never attended Hebrew school or Sunday school,” she explains. But she formed a strong connection to NFTY and was chosen to represent the youth on the temple board. Since her family did not belong to the temple, she became a temple member on her own at the tender age of 15, for the dues of $5 a year. “That was the beginning of my temple life,” Ellen laughs. The temple then supported her attendance at conclaves and NFTY activities. After college, Ellen, as she moved with her family, joined synagogues in Milwaukee and Philadelphia. In 1978, the family moved to Somerville and joined Temple Sholom in Bridgewater. Ellen was an active member there, attending worship weekly and providing a Jewish home for her family. When her family decided to change synagogues, they joined Temple Beth-El, and later that year, Ellen was asked to work on a budget for the school committee. She worked in the school system and had experience with bookkeeping and budgeting. “I said ‘yes, of course’,” Ellen recalls, “and a year later, suddenly I was chair of Ritual and later second vice president”. Her years as president coincided with the building of the new sanctuary. After her term was over, she and her husband Bruce co-chaired the Youth Committee, one of her most cherished tenures. She also initiated the leadership development program at TBE. One of Ellen’s most memorable nights was a community-wide concert for Debbie Friedman, the wellloved Jewish singer/songwriter. “The Jewish Federation asked me to chair the concert on short notice. We had a full house, with 625 attendees,” Ellen recounts. “Ten minutes into the concert, Debbie mouthed to me that there was smoke in the auditorium. We emptied the house in the dead of winter…and re-started the concert after the fire department gave me permission,” Ellen chuckles. There’s very little Liz Cohen has not done at Temple Beth-El. During the 32 years she and her husband Dave have been members, her roles have included leadership development, president, volunteer work with the homeless, social justice warrior…and dance champion. Liz and Dave were searching for community when they first moved to Princeton, and they found it in the warm welcome they received at Shabbat services, with baby Molly in tow. They raised their three children – Molly, Ethan, and Sim – here, making the Route 206 trek from their home a familiar and well-worn path. During her tenure as TBE president from 1999-2001, Liz is proud to have initiated the leadership development program with past and future presidents Ellen Davidson and Amy Rubin, and to have led the process of creating our TBE vision statement. Liz has continued to engage actively in social justice work at TBE and in the Reform movement. She co-chairs Reform Jewish Voice of New Jersey, a state advocacy arm of the Religious Action Center, giving Reform Jews across the state opportunities to meet with legislators in Trenton and at home, and to speak out on social justice issues in our state. She is a member of the URJ Commission on Social Action, and recently co-chaired the RAC’s Immigrant Justice Campaign. As a hospice social worker, Liz relishes the balance of helping individuals and families in time of need with her broader advocacy efforts. To unwind, she sings in the TBE choir, does yoga, and dances whenever she can. 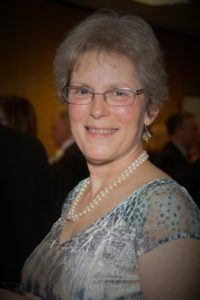 Liz’ most cherished personal accomplishment is learning trope at age 60 and chanting Torah as a bat mitzvah last December, with her adult b’not mitzvah class. Rejoicing with her family and friends that day, she was thrilled to dance the hora with her granddaughter Elena and family. (And that’s not the only dance under her belt – she and Dave are twist contest champions from several TBE sixties dances!) 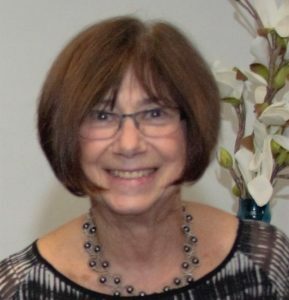 On a larger scale, she is most proud of building engagement and advocacy opportunities for hundreds of Reform Jews through Reform Jewish Voice of New Jersey. And above all, Liz is grateful for her loving husband, children, and granddaughter, and to her TBE community for supporting her efforts and bringing much joy to her life!. I love living the life of a Reform Jew! And so much of what informs my Judaism I learned at Temple Beth-El. Back in 1989, it was time to give our sons a Jewish education, so my wife Elayne and I joined Beth-El. Two important things happened. First, I felt warmly welcomed into the community when the Brotherhood president called and invited me to a meeting. There, I experienced Beth-El as the place where I wanted to belong. Second, I began regular Torah study with Rabbi Gluck. This opened my eyes as to how meaningfully Torah could inform both my life and my practice as a psychologist. By 1998, after having served on the temple Board and as an officer, I started my two years as temple president. While sometimes stressful, this was a deeply rewarding experience. After my term, I wanted to continue serving the broader Jewish community, so I began volunteering for the Union for Reform Judaism. After a term on the URJ Regional Board, in 2011 I joined the North American Board, and I’m now a URJ Board vice-chair. In my URJ work, I get to partner with Jewish professionals and lay leaders from across North America as we advance our mission of creating a whole, just and compassionate world. Of all I’ve ever done in the Jewish world, though, one experience really stands out for me: leading our temple’s 2004 Mitzvat Torah initiative, where we wrote our own Torah scroll and donated a Torah to a congregation in Belarus. Connecting with fellow Reform Jews in Minsk and Vitebsk helped me appreciate how lucky I am to belong to a thriving Jewish community and reminded me of how, indeed, all of us Jews are responsible for one another. Together with Rabbi Gluck, having the privilege of representing our synagogue to these Belarussian Reform Jews and presenting them a Torah scroll is a memory I’ll forever cherish. Outside of my professional and volunteer work, I actually make some time for fun. Elayne and I are blessed with two wonderful sons, their wives and three delightful grandchildren. 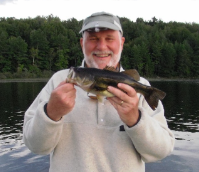 And those who know me know I love to fish. Although I spend most of my time sitting and talking to people, I’ve always enjoyed working with my hands. When I was 30, a colleague said I needed a hobby and gave me a fishing rod. I was hooked! I came to love fly fishing, an avocation that gets me into the beautiful outdoors, requires a lot of the hands and where talking has no place. Originally published in the March-April 2019 issue of the Shofar. For more issues of the Shofar, visit the Shofar archives.